Photo: Erdogan and Dovutoglu at their speech in which they spoke of the revival of the Ottoman Empire and the conquest of Jerusalem. These are the words just declared by Dovutoglu, the Prime Minister of Turkey. You would think it’s coming straight from the mouth of the Antichrist. 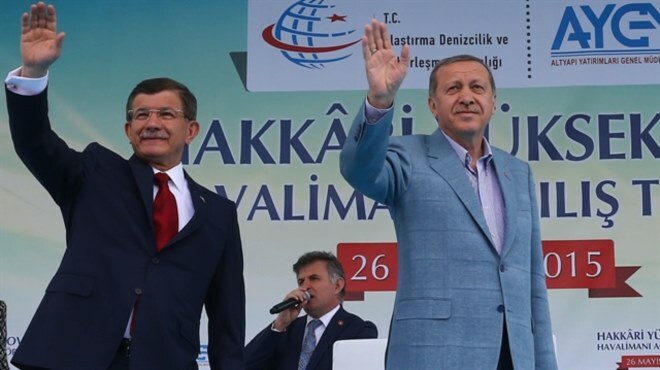 The amazing speeches by Turkish President Recep Tayyip Erdogan and Prime Minister Ahmet Davutoglu were given at the inauguration ceremony at the country’s 55th airport in Yuksekova district of southeastern border province of Hakkari, in which they made an entire declaration to the Islamic world, on their desire to conquer Jerusalem and form a universal Islamic empire. Prime Minister Davutoglu said that an agreement was made with President Erdogan to name the Yuksekova Airport in as Selahaddin Eyyubi Airport, after Saladin of the Ayyubids, the Kurdish-origin Muslim conqueror of al-Quds, or Jerusalem, and one of the great enemies of the Christian crusaders, especially Richard the Lionheart. Many of the English media outlets, like World Bulletin, are trying to cover up the reality of this speech, and are actually falsifying the translation, saying that the speech is “to give a message of unity and brotherhood.” This is false, as we have already demonstrated. Arabic media clearly shows the accurate translation. Arab media is calling it for what it is, “We will march to liberate Jerusalem: Says Davutuglo In Naming The Airport Saladin,” says the headline of Hasrr. Again, here we have the prime minister, with Erdogan, declaring the Islamic desire to conquer Jerusalem. This desire to retake Jerusalem is the same sentiment that the Muslims of the Middle Ages were fighting to fulfill. Now that Turkey wants to pursue this very same conquests, it is obvious that we are going back to Medieval Times. They are praising Saladin who fought a very fierce battle with Richard the Lionheart in the Battle of Acre, in which the Christians won, and who defeated the Christians in the Battle of Jerusalem, and they are also speaking of the Battle of Gallipoli, in which the Muslims defeated the Christian English. Talking to the dead is against orthodox Sunni Islam, but it is not against Sufi Islam, in which Rumi (the top theologian of Sufism) encouraged the communication with the souls of dead Sufi masters. What Davutoglu is saying is that whatever was East of Turkey that was Ottoman, and whatever was West of Turkey, that was Ottoman, we will bring back together under the Ottoman.